Logan not only delivered the Wolverine movie most of us had been waiting years to see, but it also gave us one hell of a breakout performance from the young and super talented Dafne Keen as X-23. Looking back, it is unlikely anyone would want to change that now, but it turns out another very talented young actress was in contention for the part. Strangers Things star Millie Bobby Brown recently revealed that she actually auditioned for the part of X-23 in Logan alongside Hugh Jackman. The 13-year-old actress revealed that she auditioned for the role with director James Mangold and Hugh Jackman to Variety as part of their Actors on Actors series. Millie Bobby Brown was speaking with Westworld star Evan Rachel Wood about her best and worst auditions and felt that her audition for Logan was the best she's had to date, even though she ultimately didn't get the part. Here's what she had to say about it. "The best audition for me was Wolverine. I went for Logan, I went for the little girl [X-23] and I watched it. She [Dafne Keen] was incredible, but I went for it. It meant so much to me. I was filming Stranger Things and I was like, 'It's going to be amazing, I'm going to really prepare,' and I sat in my room reading the lines. Honestly, for me, I felt so, I felt an actor, in the audition room, hitting Hugh Jackman, and James Mangold sitting right in front of me. I was like, 'Oh my goodness!' It was one of the best auditions." As it stands, Logan is truly packed with excellent performances, Dafne Keen included. So it is hard to imagine doing it differently, but it is also easy to imagine Millie Bobby Brown doing a great job. 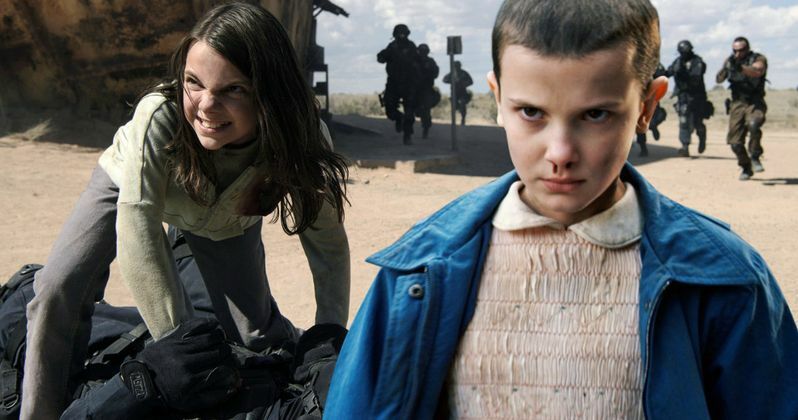 She is excellent on Stranger Things and, despite not getting the part as X-23, she is moving on to other big franchises. She is going to be starring in Godzilla 2 and should have no issues getting more work in the future. She also talked about some auditions that didn't go well in the past, such as one she did for a Barbie commercial. "It was very awkward. It was hard. I had to jump up and down. They gave me this, I don't even know what it was, it was just this thing I had to hold and stand up and play pretend with this other girl." Needless to say, things have worked out well for everyone. Millie Bobby Brown is a promising, rising young star who has plenty ahead of her. Logan, partially on the strength of Dafne Keen's performance, is one of the biggest hits of 2017, both critically and financially. But it is interesting to think about seeing Eleven spending some time on screen with Wolverine. You can check out the interview clip with Millie Bobby Brown for yourself below.